When teaching literacy and math skills to preschool children, it's nice to weave the skills into a theme. One fun theme that most kids love to study is the zoo. My boys love animals of all shapes and sizes, and the zoo is the perfect place to visit to see them all. We often continue the learning when we get home by doing zoo activities for preschool. While visiting the zoo, children can count and classify animals with a zoo scavenger hunt. Kids can grow vocabulary skills as they label animals. Even if you can't visit the zoo, the zoo theme can be used at home or in a classroom of children. There are so many wonderful picture books about the zoo. 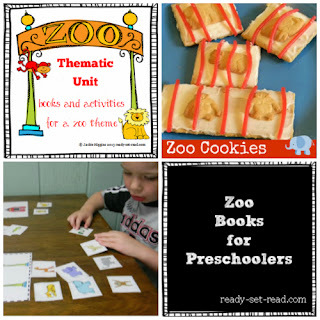 After reading, children can make zoo themed snacks, crafts, and play animal games. The possibilities are endless! In fact, I recently realized I had so many zoo resources, I wanted to put them together into a zoo activity resource page. 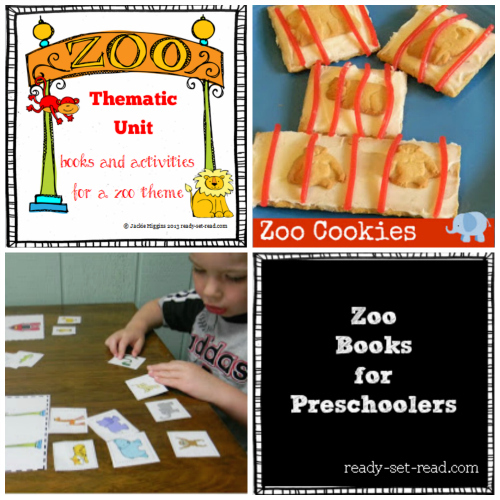 If you are looking for ideas for your zoo unit, check out these resources. I've also been organizing all of my preschool themes. 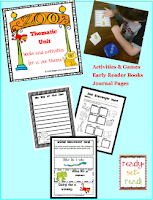 If you need ideas for other preschool units, check it out! Free Printable: Zoo Activities and Books --downloaded over 5,000 times! Thank you so much Deb! You are such a great supporter of other bloggers. I appreciate your free printables of the day.